At last one of the world's most huge fan base that follows attentively the creative work of a legendary heavy metal band Metallica has got its ninth studio album. After its not most successful last record, 2003's St. Anger announced as an attempt to return to the early period of the band's history the members among which there is a new one, bassist Robert Trujillo, have started working on the new material with all possible effort. It should be mentioned that these songs have already existed in embryo for minimum four years but were never made it to any collection or album. Traditionally for the band the process of writing and recording the new songs has lasted almost three years which finally resulted in quite a serious work Death Magnetic. This time around Metallica has really come close to its earlier and most successful albums turning once again to dark themes and complicated composition structures. Naturally the main topic of Death Magnetic is death and all the negative things accompanying it so the band has again confirmed its status of one of the heavy metal founders and continues its brilliant career for the third decade already. The shortest song on Death Magnetic is five minutes long and the longest is almost ten. There are no simple tracks here, none of them being of a verse-chorus-verse structure and all pleasing with great guitar hooks, impressive drums and expressive if sullen melodies. The record opens with the sounds of heart beating on That Was Just Your Life amazing with its energy and reminding of the band's most successful hits One. An evil composition The End Of The Line and broken and interrupted Broken, Beat & Scarred do credit to both guitarists and a drummer while Hetfield's vocals on them is simply breathtaking. Although single The Day That Never Comes is not the album's strongest track it gives quite a distinct impression of what is presented on it while the real present to the fans is The Unforgiven III. Perhaps this song will not become the same rock masterpiece as two of its previous parts but it fits greatly with the record's fatalistic concept and proves to be no less monumental. A powerful and impetuous number The Judas Kiss contrasts with the longest track on the record, Suicide & Redemption, a slow but by no means a soft one, and the album closer is a really thrash composition My Apocalypse, full of the destructive power and the most roaring drums and guitars that Metallica is ever able to provide. For the first time in its existence Metallica has refused working with its long-term producer Bob Rock and preferred no less famous professional Rick Rubin. Besides Death Magnetic has become its first work on label Warner Bros. although it belongs to Warner Music Group just like the previous one, Elektra Records. 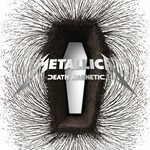 It is the requirements of the new producer that have made the process of working on Death Magnetic that long. The point is that he wanted the members to start recording the songs only when they were utterly sure about each particular song. If before they would let themselves make some changes or improvise a little while already recording this time they chose not to do it. The happy fans have had an opportunity to watch all the work on the Internet but the result will definitely surprise them with its being so harmonious and unbelievably powerful. The fact that the album's pirate copies appeared in some stores ten days before the official release actually pleased the members a lot for it proves that their music still remains much anticipated. No surprise as Metallica will always be Metallica no matter how much time we have to wait for its next, tenth album.